George Washington, Thomas Jefferson, Ben Franklin, Andrew Jackson, Abraham Lincoln and many other historic figures have laid claim to portraiture on USA currency. These old “standbys” were the go-to solutions when an engraver was stumped about who to place center stage on his note. By all accounts, these decisions were not made lightly: every representation of America’s forefathers was painstakingly engraved into plates that would preserve their significance for eternity. But what about animals? Surely they have a place in American lore? Is the happy Bison on the 1901 $10 legal tender note the only representative from the animal kingdom? Not so fast! How could we forget the Bald Eagle, the symbol of enduring American freedom? Long before the Bison at the National Zoo made his appearance on the $10 1901 legal tender, the Bald Eagle reared its majestic head and defiant pose on a number of famous American notes. 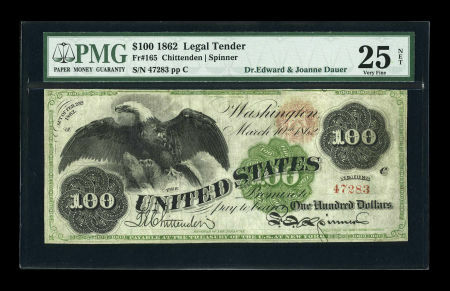 Indeed, the first time it was put on public display was in 1862 with the issuance of the $100 legal tender note, signed by Chittenden-Spinner. This inspiring eagle was “done right the first time” – just like your old man always told you when it came to finishing what you started 8) . The bald eagle perched above the floral decorations of the denominated numbers “100” is awesome and captures the raw emotion of a nation experiencing civil turmoil though not easily forgetting its fiercely original independence. This particular note is from Dr. Edward and Joanne Dauer, two of the foremost collectors of rare United States currency. It is graded a respectable Very Fine 25 NET by PMG. It is regarded as the finest example known of this note type across both major grading services (PCGS and PMG). To our knowledge no other 3rd party grading service (CGA, CGC, or otherwise) has graded a similar note. In total, only 13 examples are known to date. The Dauer specimen last hammered for a reasonable $43,125 USD during a Heritage Auction on September 28, 2007. Given the prestige and rarity of this note, we’re surprised it didn’t go for more. When and if it appears again, it will certainly command a high premium and will be the hallmark lot of any auction lot list it finds. Fr. 93 1862 $10 Legal Tender – A small eagle at the top of the note cries out to Lincoln, pictured at left. Fr. 188 1878 $5,000 Legal Tender – The reverse of this epic note shows a large, proud Bald Eagle gripping an American flag in its talons. Fr. 189 1878 $10,000 Legal Tender – The reverse has an Eagle remarkably similar to the $5,000 note; except this one means business with an American flag draped over a sharp spear tightly clutched in one of the Eagle’s talons. Fr. 190 1864 $10 Compound Interest Treasury Note – Although partially obstructed by some markings, a symmetrical Bald Eagle takes center stage between a portrait of Salmon Chase and a female allegory representing Peace. Fr. 212 1864 $50 Interest Bearing Note – The lean and mean Eagles seen on the other notes is replaced by a much burlier bird; and given this note’s extreme rarity, this portrayal is quite appropriate. Last, but certainly not the least, Fr. Nos. 226-236 1899 $1 Silver Certificate – This popular note is specifically known as the “Black Eagle Note”. It is a note everyone must have in their collection in one form or another, and despite a high level of interest from collectors on all budgets, it has remained relatively affordable. This year’s 2012 Schaumburg CSNS (Central States Numismatic Society) paper money show is locked and loaded. The action begins April 18 and concludes on April 22, 2012 with a recovery day in between on April 21, 2012. Judging from the eye-popping notes in this seminal auction’s catalogs, this year’s CSNS should be a thrilling occasion, with notes queued up for both high-end collectors and collectors on a budget. Here is the schedule of sessions during the auction. Note that schedules are subject to change. Please visit www.currency.ha.com – click here – to see the latest updates to the schedule. (Lots 15001-15441) – 6:00 PM Central Time, Wednesday, April 18, 2012. (Lots 15442-15976) – 6:00 PM Central Time, Thursday, April 19, 2012. (Lots 15977-16328) – 1:00 PM Central Time, Friday, April 20, 2012. (Lots 16329-16832) – 6:00 PM Central Time, Friday, April 20, 2012. (Lots 19001-20607) – 10:00 AM Central Time, Sunday, April 22, 2012. With 5 sessions of currency to choose from, how can you go wrong? We’d also like to expound on what might be one of the finest currency offerings in recent memory. Heritage has included an exceptionally rare Fr. 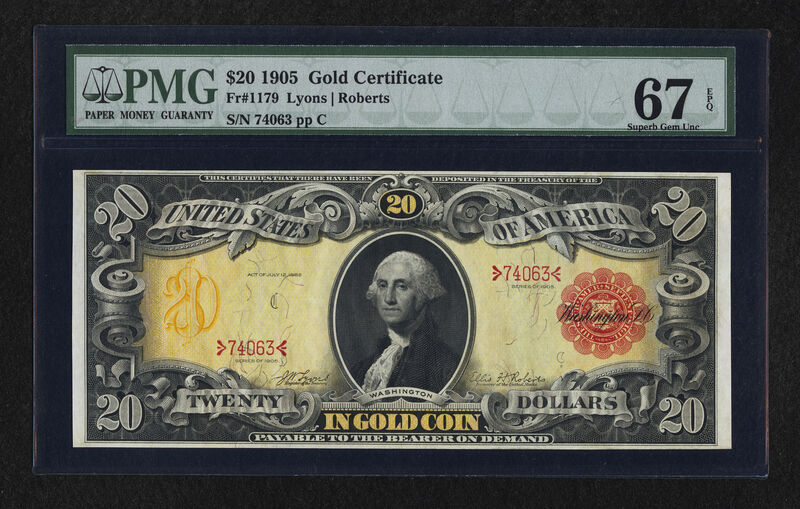 1179 1905 $20 “Technicolor Note” Gold Certificate with Lyons-Roberts signatures in Session 4. Normally, these notes surface in Fine-Very Fine condition and don’t cause much of a disturbance. This year is decidedly different: this particular $20 Technicolor Note is graded a god-like Superb Gem Uncirculated 67 by PMG. By all accounts, this is the finest 1905 Fr. 1179 $20 Technicolor Note EVER offered by a third party auction service in history. It is unknown whether anything graded the same or higher has changed hands privately. This note is so cool that it has its own video – visit the Heritage Auctions website to see it for yourself 8) . As you can see, the price climbs higher than Mt. Everest as the condition of the note improves. This trend is actually quite common when it comes to Gold Certificates. The bulk of large and small size gold certificates are on average Very Fine at best. These notes saw heavy usage and most were redeemed when the USA fell off the gold standard beginning in 1933. In the following years, the government stopped honoring the notes altogether, making them rather useless for regular folks. That means most people didn’t keep them around but for sentimental reasons or as inheritance items for their children. Now that we have established price points for the middle portion of the bell curve, let’s zoom ahead to the Superb Gem Uncirculated 67 point that lies FAR away from middle ground. The starting bid for this lot, #16804, is a whopping $85,000 USD Reserve – in actuality $97,750 with the buyer’s premium. That’s not all folks! Heritage expects aggressive bidding on this once-in-a-lifetime opportunity, and estimates the lot could hammer at or above $120,000. Good Luck to all bidding in the Schaumburg CSNS 2012 auction, and don’t forget, we’ve also got a great selection of notes here at PaperMoneyAuction.com that don’t require taking out 2nd and 3rd mortgages on your home! All terms, phrases, and auction scheduling information are property of Heritage Auctions, LLC. This article is for news and entertainment purposes only. PaperMoneyAuction.com is not compensated for providing this information. Anyone interested in placing a bid on this note should visit the Currency section of the Heritage Auctions website.